When you think you know all about the distinct types of styles and types of RVs, a modern style pops up that you weren’t even aware existed. Let’s think of this scenario, you have a family of four and are considering your RV options. You like the simplicity, cost, and compactness provided by a pop-up camper, but the available room won’t cut it for you. You want the practicality and space offered by a travel trailer, but they are too cumbersome on the road. How can you get the compactness of a pop-up with the space and amenities of a nice travel trailer? You can consider expandable travel trailers. Let's look at expandable travel trailers including their pros and cons. From here, you can decide if this type of trailer is right for you. The expandable travel trailer is a hybrid between a pop-up camper and a traditional travel trailer. The trailer looks like a travel trailer on the road, but when you arrive at the campsite, you expand areas to provide more room. Often, this extra room comes in expanded sleeping quarters found at the front and back portions of the trailer. In more customized models, you get extra space in places such as the living room and dining room. You can think of this room like slide outs found in some motorhomes and coaches. The expandable travel trailer stays compact on the road but expands to accommodate more once you arrive at your site. This makes it much easier to tow but gets all the space you need once you reach your destination. Pro Tip: Expandable travel trailers were initially designed as a type of mobile home that could be more easily transportable. It’s possible you’ve seen these before even if you aren’t familiar with the trailer type. Pop-up campers are popular due to their compact size and low weight. While most expandable travel trailers cannot collapse to the size of a pop-up, they save space by collapsing and expanding. This gives you a much smaller footprint on the road while on your travels. An expandable travel trailer can be customized more than many types of RVs on the market because of the increase in space. This allows for a bigger kitchen, a bigger bathroom, and more area for sleeping. Many people may hesitate at pop-up campers because they are not feature rich. This is a result of the collapsibility of the pop-up if it can’t compact then it can’t go into a pop-up camper. Most expandable travel trailers are travel trailer bodies that have expandable sleeping quarters. The main living areas of the trailer can still be decked out with lavish amenities and features. Some of the significant benefits of expandable travel trailers do have their drawbacks when it comes to the sleeping quarters. Like a pop-up camper bed, luxurious comfort is usually not the name of the game. The expandable sleeping quarters can be cramped. Your walls are made of vinyl and the sleeping quarters don’t offer much protection from the outside elements. The expandable portions will also face the same enemies as the pop-up campers such as leaks, tears, mold, and mildew. This means the expandable travel trailer will need more maintenance than a travel trailer. Speaking of maintenance, expandable travel trailers need more maintenance than most RV types on the market because of the size and customization options available. They said have bi-annual inspections to ensure everything is in working condition. Expandable travel trailers can be more expensive than other types of trailers on the market, such as fifth wheel RVs or traditional travel trailers. Due to the unique nature of this trailer type, building, customizing, and transporting them can up the cost of long-term maintenance and storage. Still unsure if an expandable trailer is right for you? Let’s learn some of the unique features that make an expandable trailer different from other RVers. Expansion: Expansion is the hallmark of expandable trailers. Like pop-ups, expandable trailers provide extra room once the RV is parked. The type and amount of expansion vary from trailer to trailer. Small to Medium-Sized: Because expandable trailers are focused on compactness they are rarely large. Most RV trailers sleep two to eight people which makes them great for most average-sized families. Variety: There are several styles and types of expandable trailers. This means you can find one to meet your specific needs. Light: Most expandable trailers are light. You won’t need a full-sized pickup to drive an expandable around. Great Amenities for Size: Most expandables have tuck-away sleeping compartments so the rest of the trailer can be devoted to amenities. Despite their small size you can find ovens, ranges, stand up showers, couches, and more in an expandable trailer. Zip-Out Sleeping: The expandable part of expandable trailers is almost always the sleeping quarters. Not the most comfortable of sleeping arrangements but you can upgrade your sleeping for better ZZZs. Now that you know more about what to expect from an expandable let’s look at three great expandable trailers available right now at your local RV dealer. Livin’ Lite is a popular manufacturer of lightweight towables, and its Quicksilver is a not quite a pop-up camper, but not quite a full-scale travel trailer. The trailer unfolds with bunks, a sink, and a dinette. There aren’t a lot of bells and whistles on the Quicksilver, but it’s manufactured for those who intend on using it for meals and sleeping. The Quicksilver is almost versatile and meant for everyone - you can tow it with a standard-sized car. A quick setup and strong materials make the Quicksilver an excellent expandable trailer if you’re looking to step up from a tent but aren’t ready for a larger RV. The Roo is one of the most popular expandable trailers on the market due to its price, quality, and amenities. The expandable part of the Roo is found in the pop-out aft and rear bunks that provide sleeping quarters for four people – six if you’re friendly. 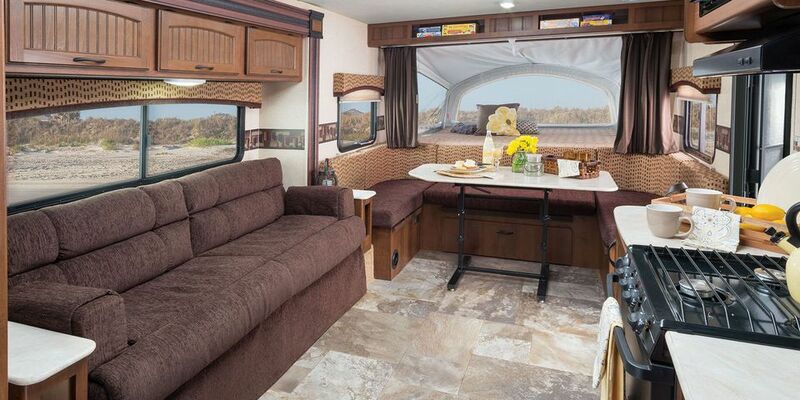 Though the Roo is compact, it’s filled with great amenities like a double sink, oven, range, a large couch, booth-style dining, and an HD TV. Since the zip-away bunks don’t take up any floor space, the body of the trailer is fully devoted to living area. The Roo is a great all-around towable and one of the best examples of an expandable trailer. SolAire makes some of the most luxurious mass-produced travel trailers currently on the market. The eXpandable provides a surprising amount of room and luxury all built on the aluminum-framed superstructure. There are several models and floorplans to match your RVing style, but the largest eXpandable still comes in at under 6,000 pounds GWR. It may be small, but you won’t be shafted on amenities. You can expect oven, range, custom cabinetry, plenty of space to move about, and an entertainment center all packed into this quirky trailer. If you want one of the best expandables on the market, you can’t go wrong with SolAire. Expandable travel trailers are an excellent option for those who can’t make up their mind between a pop-up and a travel trailer. The hybridization of these two RV types makes the expandable travel trailer a great option. While most don’t travel on the road with this type of RV, it’s perfect for those itching to find a destination to call home.